I am very excited for you if you are considering Learning Tarot; for Tarot is a fantastic tool which can help you develop your intuitive and psychic powers. You are about to embark on a wonderful journey of self discovery. How to use the first method – Learning Tarot – Set Meanings and Layouts. First of all, get yourself a Tarot Pack to practice with – there are hundreds of Packs available, so choose one that you feel drawn to, or that is recommended to you by a trusted source. Make sure that an explanatory leaflet is enclosed with the Tarot Pack. Begin to learn the meanings of each card from the Tarot Pack Leaflet. At first you will have to refer back to the leaflet for the meanings of each card, but gradually with practice, the meanings will become second nature to you. Practice, Practice, Practice. There will also be examples of Card Layouts in the Tarot Pack Leaflet. So, put out the cards as directed and then interpret them in the light of their placement. For where a card is placed in a Spread (card layout) has a definite bearing on its interpretation. You can start with simple card layouts. For example – three card layouts: one card for the Past, one for the Present and one for the Future. Or even more simply, ask a the Tarot Cards a question, then pick one card and interpret the card in the light of your question. Where you can find a Tarot Pack on line. Learning Tarot – meanings of each card for the traditional Rider Waite Tarot Pack (these same meanings are also used in many other Tarot Packs). Obtain a Tarot Pack for yourself, one that you feel drawn to and feel comfortable with. Don’t look at the accompanying leaflet and don’t look online for the meanings of each card. For you are going to rely solely on your own intuitive interpretations, so that you can discover your own unique meanings of each card. There are several ways that you can do this, so choose whichever way feels right for you or intuitively find your own way of working. This is a wonderful way to tune in to and develop your own psychic gifts. Your rational mind may well come in some way along the line, telling you that what you are experiencing or feeling is stupid or too far out. Be aware that this voice in your head will not help you. Do your best to ignore what it says. Anything that strikes you from the visual images on the card. This way you will familiarize yourself with the cards and find your own meanings of each card. 2) Draw a Card from the Tarot Pack each day and imagine yourself entering into the Tarot Picture. Look around the environment you have entered, envision yourself merging in with the Tarot landscape. Explore the space and interact with any figures you find there. Observe and ask questions. Don’t be concerned with “imagining things” because imagination, intuition and the psychic senses are very closely linked. Exit from the card and write down your findings. 3) Draw a few cards from the tarot pack and start making up a story based around the cards. Let the story take over, refrain from judging, be like a child. In a little while you will find that what you are saying is starting to make some real sense. 4) Card Layouts – lay out however many cards feel right for you – you may find yourself preferring certain card layouts, or you may choose to lay the cards out differently each time. Gradually, given time and practice you will begin to trust the sensations, images and stories that come to you. The more positive reinforcement you gain, the more you will begin trust in your own intuitive interpretations and psychic skills. Work by yourself to begin with, then when you feel confident, start giving Readings for friends and relatives, who are supportive and who will give you helpful feedback. 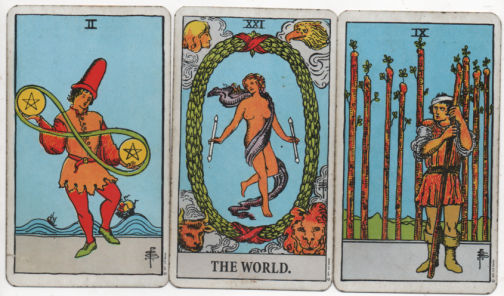 I very much hope you have enjoyed this post about Learning Tarot. All good wishes for your exciting psychic journey of adventure and self discovery. You might also like to consider subscribing to my regular bi-monthly Intuition Development Newsletter called ‘Intuitive’ – devoted to helping and encouraging you to develop and use your own Intuitive and Psychic Senses.